This post aims at sketching out a plenary address to be given Oct 11 at the 2014 GLoCALL conference in Ahmedabad http://glocall.org. 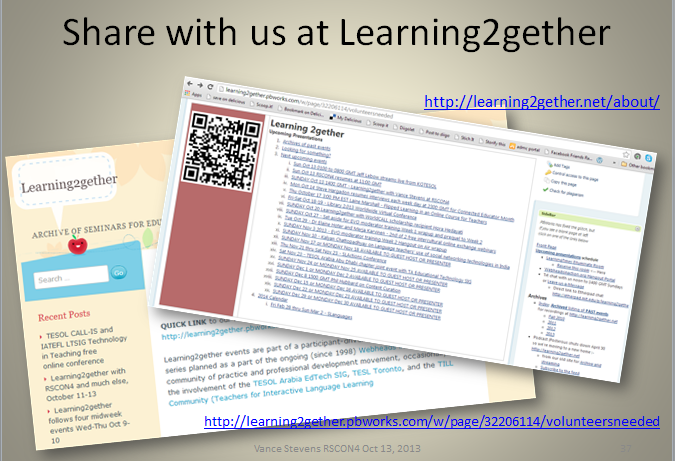 It will be webcast on WizIQ and will be billed as a Learning2gether event, as shown below. I'll be working on this blog post between now and then. 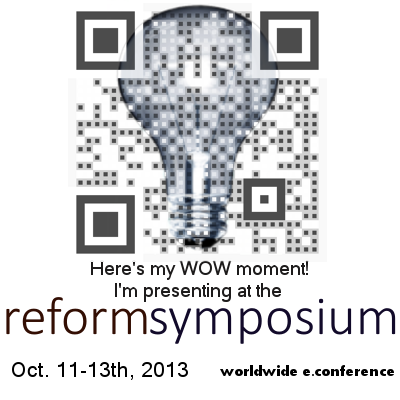 There have been many talks at the conference on flipped classrooms, but so far, no flipped presentations (except for mine). My slides for my workshop on Oct 9 were posted in advance of the event, and I posted my blog URL in the discussion forum at the WizIQ link below the day before the event, and am about to post my slides as well. 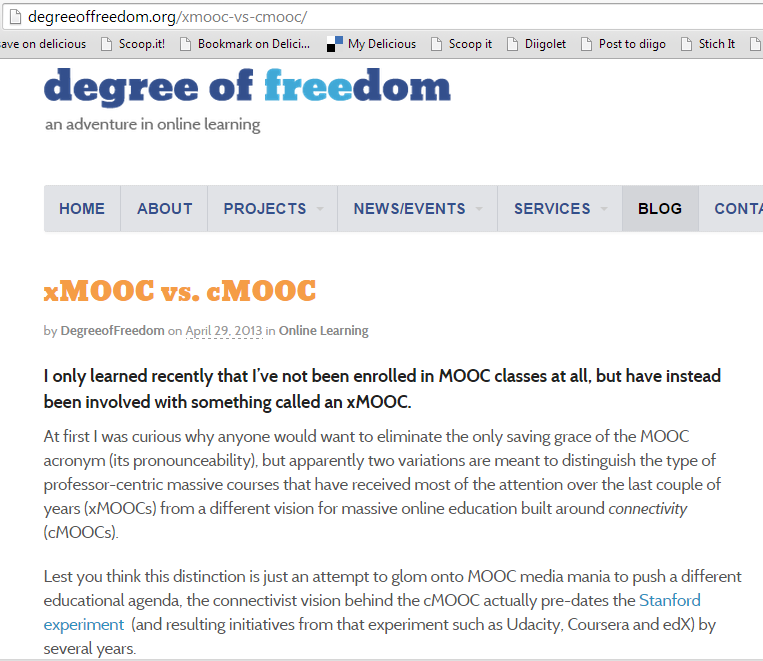 That of course was a "c" or connectivist, MOOC. George Siemens wrote perhaps the seminal article on connectivism (2004), which can be summed up in the metaphor of the pipes being more important than the content within the pipes, or as Stephen Downes has often expressed it, knowledge in a network is theoretically available to any one in the network, as long as that any one can access that knowledge on a just-in-time basis via tools available on the network. In his view an instructor who marks out the learning path too carefully for his students 'eviscerates' the learning experience. He thinks learning best takes place when learners are faced with doubt and chaos. Chaos, incidentally, is what Downes says is what we see all around us, all the time, everywhere we look (get used to it :-). 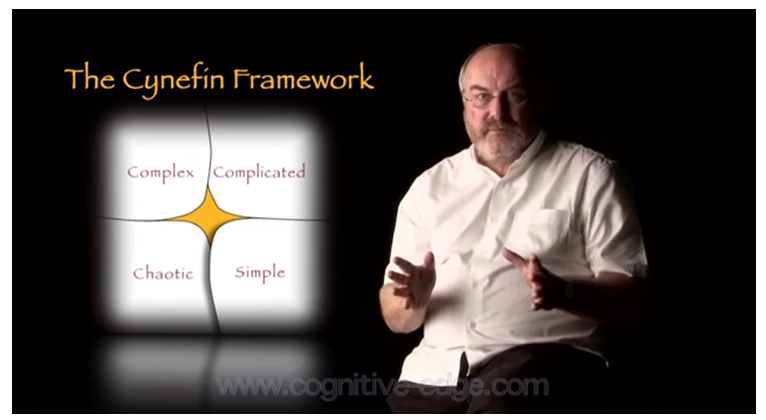 Dave Snowden is working on a Cynefin model that shows how problems can be obvious, complicated, complex, or chaotic, and what strategies are needed to address the range of problematicity. He points to the cliff where, if you try to go from a training regime preparing you solve simple problems, you risk a heavy fall when confronted with chaotic ones. I refer to my own experience as a PADI dive instructor to show that my teaching people to dive amounts to training. The knowledge and skills required can be trained and exercised in a way that works predictably from one student to the next. Language learning can be trained only in the way you would train a parrot. We can get students to pass tests in memorized verb conjugations but in reality, what one needs to know to become fluent quickly becomes chaotic. And what one needs to know varies markedly from one person to the next. In such situations, where the problem to be resolved tends toward chaotic, a connectivist approach might be appropriate. Connectivism leverages the fact that knowledge required to address the problem exists online in the form of web pages and tutorials but more importantly in the form of people who can either help by sharing expertise, or who are willing to accompany you on your learning journey. Course - this is an easy one. 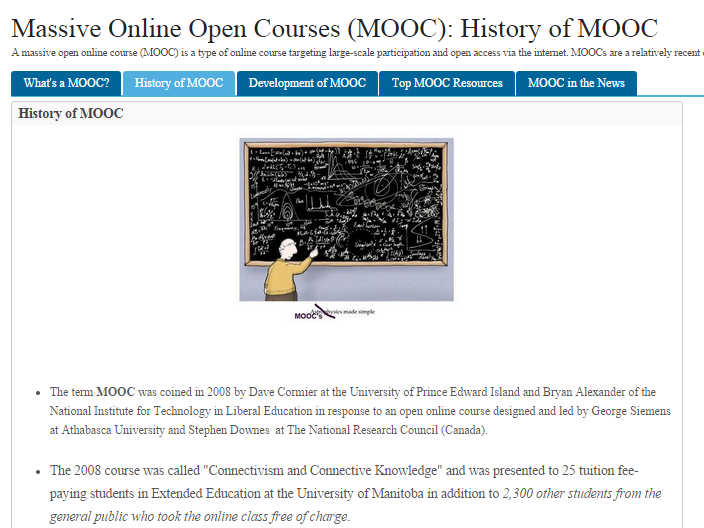 A MOOC is a course. It starts and it ends. When it ends the instructor or moderators can switch off the lights, but the community may remain, and often does. Online - another easy one, it's online. 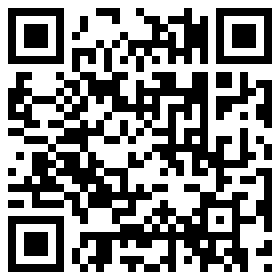 People can access it on the Internet. Some people might enroll in a course at a university for credit that also operates as a MOOC, but the interaction is mainly online, and with a wider community of virtual interactants. Online also sets the MOOC in a world of abundance, whereas other options are more impacted by scarcity. Open - this is a more problematic concept (for some). Open means anyone can access the course materials, artifacts, and archives without having to log in or provide credentials. Nothing is forever but open implies that the archive will be available to anyone for some time to come, ideally, in perpetuity. It can be argued that a course that disappears shortly after running, or that is available only to logged in participants, is not truly open (though it might have been free, as in beer). Massive - this follows from open. A massive course is available to anyone, so thousands might sign up. Of these, hundreds might actively participate throughout the course. Despite what you may have heard about high attrition rates in MOOCs, they commonly matriculate many times more than would be expected in a traditional course running at a brick-and-mortar institute of higher education. Massive requires a different approach to educational design than heretofore. For one thing courses have to be designed so that they scale. Algorithms might be necessary to augment some aspects of course management. For example, if anyone can "participate" with no login, who are your participants? Stephen Downes has a tool called gRSShopper that allows people on a MOOC to register their blogs with the course, and the script finds their posts relevant to the course when they tag them with the course tag. This allows thousands of participants to have at their fingertips the hundreds of blog posts and comments that might derive from the MOOC on a given day. 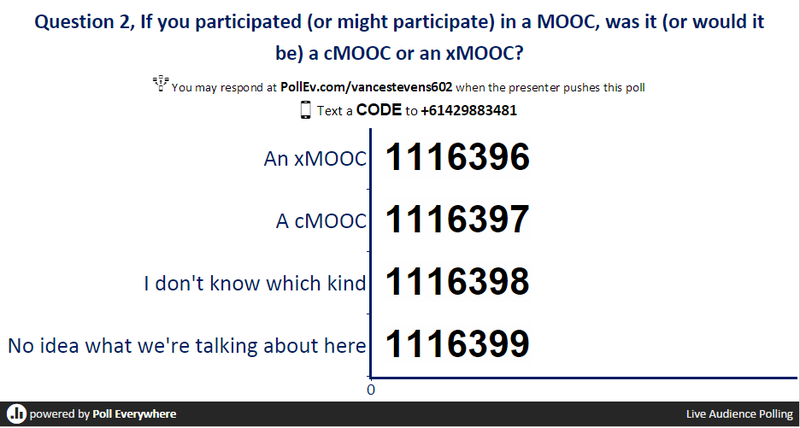 Here's an example from a MOOC where a participant engineered similar aggregation capability and shared it with participants in the MOOC. 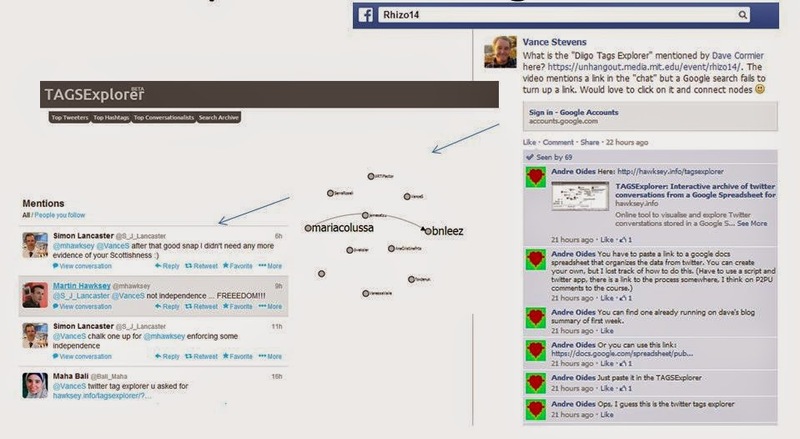 Notice how word spreads in a MOOC, node to node throughout the network. Of course having access to content "at your fingertips" is like having a TV -- it doesn't mean you can actually know what is happening every moment on every channel, or that you might even care. With TV our real-life filter mechanisms are such that we don't worry about what we're missing each second, never mind the articles appearing in newspapers and magazines, the radio shows, the tweets, the Facebook posts we're missing. In this world of pervasive media, the best-adjusted work with what we pull toward us, not what is pushed at us. 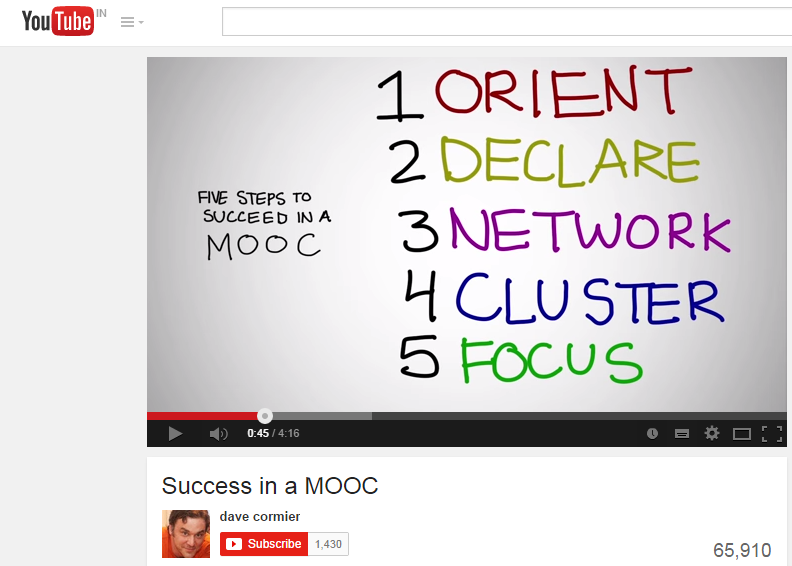 Dave Cormier has suggested five stages of succeeding in a MOOC. First ORIENT in the MOOC, figure out what is there, and at some point, DECLARE who you are and how you think you fit in. Now you are in position to NETWORK with others declaring interests similar to yours, and if you hit it off with certain people in the MOOC you might form a CLUSTER. This might even lead to collaboration, in the FOCUS stage, where you get out of the MOOC what you want, not what someone thinks you should learn. But keep in mind we are talking about cMOOCs. 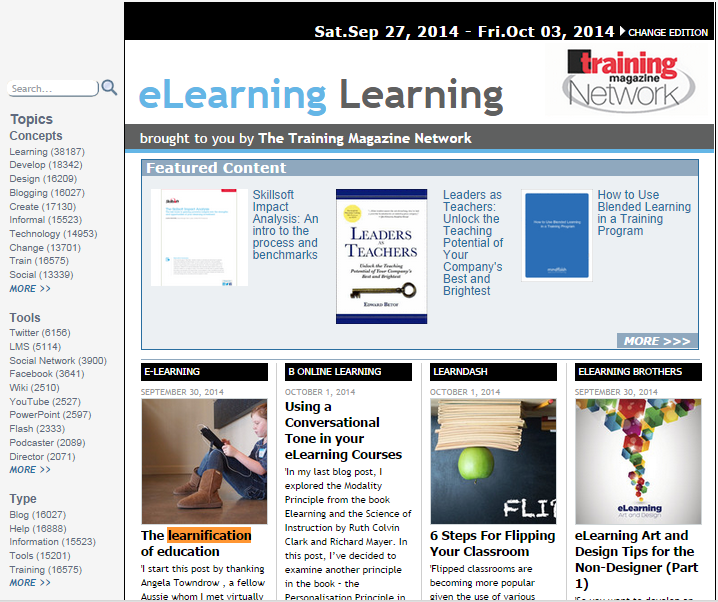 And finally, as evidence that MOOC learning persists after the MOOC has ended, I just the other day noticed a post on "Learnification" and clicked on it to see what such a clever and enigmatic term could possibly be about. Not surprisingly, the writer was reflecting on something stimulated by a colleague "whom I met virtually via a mooc, and from whom I continue to draw insights on things related to education." It is not at all unusual for countless such relationships to form in the network and cluster phases of succeeding in a MOOC, but it's not every day I manage to capture such an exchange and use it to make a point in my own blog post. 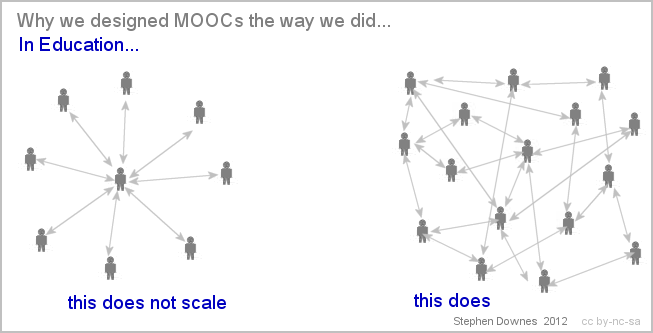 So this so far has been an attempt to convey a sense of what goes on among interactants in MOOCs, and what many nurtured on the early MOOCs, consider to be the great strength of MOOCs. That is, they are not only a means to learn something concrete, but they model a means to learn along the connectivist ideals of the creators of the concept. However, many who are being exposed to MOOCs now are not necessarily aware of that early history and theoretical underpinning. 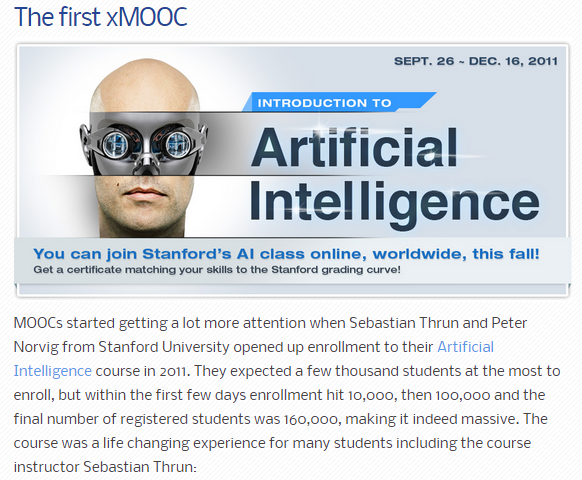 The first xMOOC was the brain-child of Sebastian Thrun and Peter Norvik, who took the Downes-Siemens-Cormier notion of "build a MOOC, they will come", and in 2011 opened a course on artificial intelligence at Stanford to just anyone, for free. As can be seen in the article above, it attracted 160 million participants. 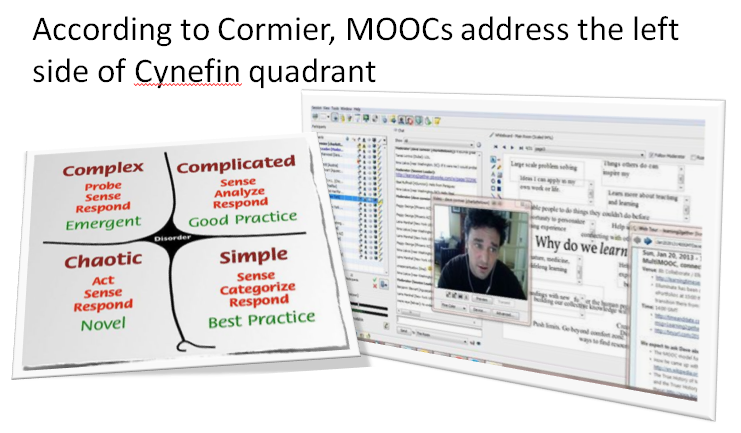 But this was not a connectivist MOOC in the Siemens-Downes-Cormier sense. It presented a course of training that would enable anyone who wanted to follow it to earn credit at Stanford. Amazon provided the online testing infrastructure to ascertain that students were covering the material. The concept was so successful that shortly thereafter Thrun left his tenured position at Stanford to start a company called Udacity that was the first of the so-called xMOOCs. Coursera formed soon after, followed by EdX, whose name Siemens co-opted in making the distinction between cMOOCs and xMOOCs. 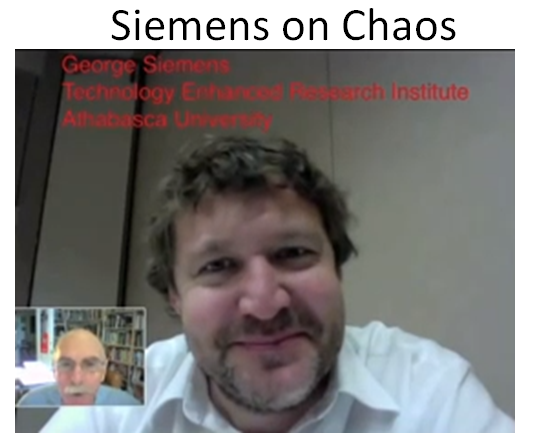 As Siemens characterizes it in the 2012 post where he coined the term xMOOC ("xMOOC?" http://www.elearnspace.org/blog/2012/07/25/moocs-are-really-a-platform/)"Our MOOC model emphasizes creation, creativity, autonomy, and social networked learning. The Coursera model emphasizes a more traditional learning approach through video presentations and short quizzes and testing. Put another way, cMOOCs focus on knowledge creation and generation whereas xMOOCs focus on knowledge duplication." 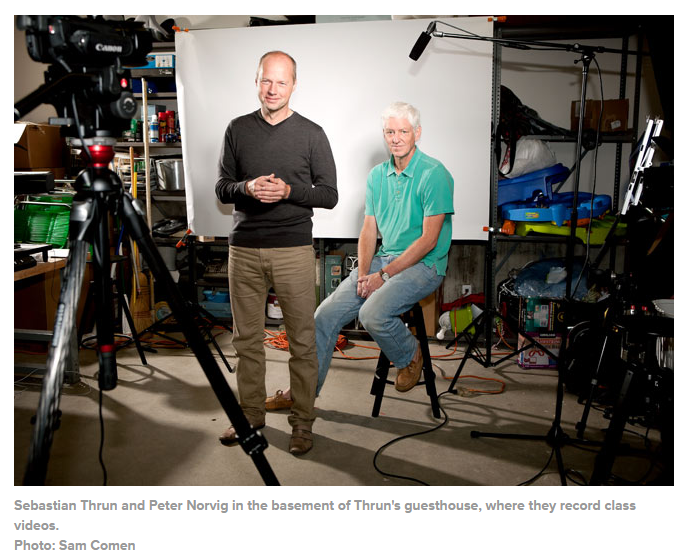 As can be seen below, Thrun and Norvig are preparing tutorial videos to in effect "flip" the teaching in their MOOC, so that students can access the content in didactic mode away from the main focus of interaction and when interacting with professors or with one another, discuss the content in a way that helps them to understand it, after presentation. Flipped classroom techniques are characteristic of all kinds of online and blended learning environments, not just MOOCs. However, the ability to flip effectively with media verges on another literacy skill, one called Digital Storytelling. I would like to focus now on how these developments have impacted how we are coming to interact with each other as teaching professionals in a connected / connectivist world, and how this should be informing our teaching. 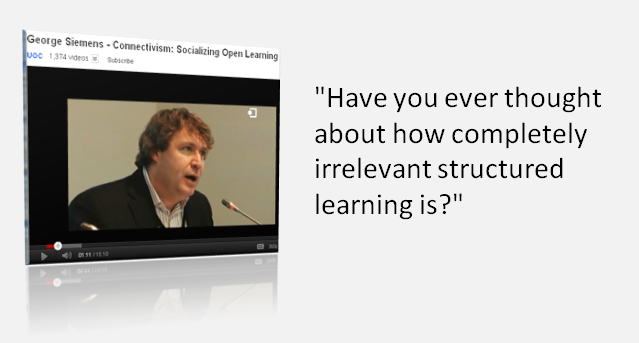 There is a MOOC going on right now that encapsulates much of what I have to say this morning. First of all, it's run by three people who are very well known in the world of connected educators. 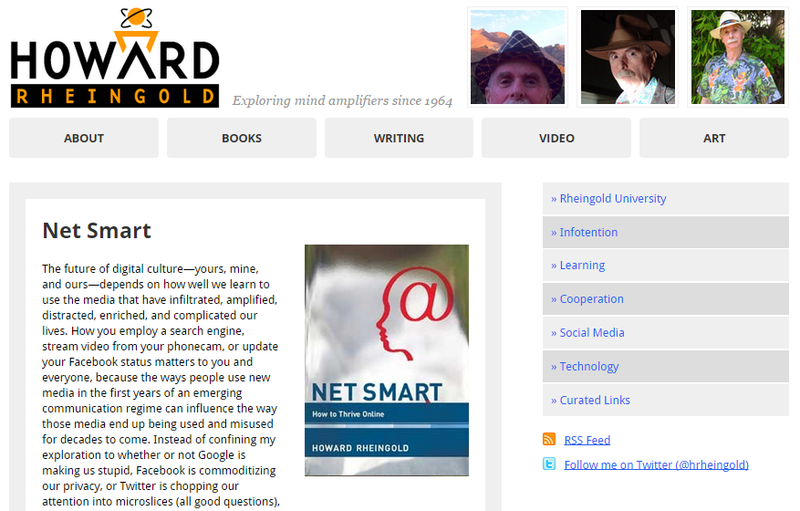 Howard Rheingold is an eccentric Stanford professor who has written several books on net litereracies. His language is as colorful as his shirts; for example one digital literacy skill mentioned in Netsmart is crap detection. Jim Groom is a professor at Mary Washington University and is famous for at least three significant initiaties. One, he is the poster boy of EduPunk, a mindset of improving quality in education by disrupting it. Two, he preaches a domain-of-one's-own and has managed to implement the concept where he teaches by getting his college to empower all incoming freshpersons to maintain e-portfolios under their own domains and on their own servers. And three, he teaches DS 106, or Digital Storytelling 106. Alan Levine, who blogs on the name CogDog (featuring his favorite pet saluki). One of his best-known posts is 50 ways to tell a digital story, so for obvious reasons he has worked closely with Jim Groom on DS106. Connected courses teaches what you need to know to create a domain of your own and tell your own digital stories and connect your digital stories to those of others. As indicated in our cultures' rich heritage of mythology, storytelling is how we make sense of chaos. According to Jim Groom, digital storytelling is a narrative of your thinking. So this MOOC has it all. It's a free course you can choose to take and learn from three of my digital heros (at other times you can take MOOCs put on by Stephen Downes, George Siemens, and Dave Cormier, so heroes abound in the world of MOOCs). You can join it any time, its teachers have flipped the classroom and put tutorials online to walk you through what you need to know to get the most out of the courses. 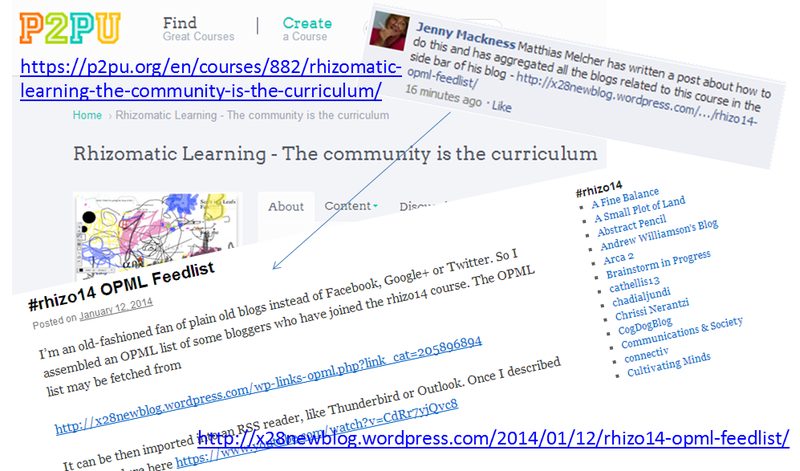 It's a cMOOC, so you can connect with others in the course and learn from and with them. You connect by reflecting on what you are exposed to and blogging a narrative of your thinking. 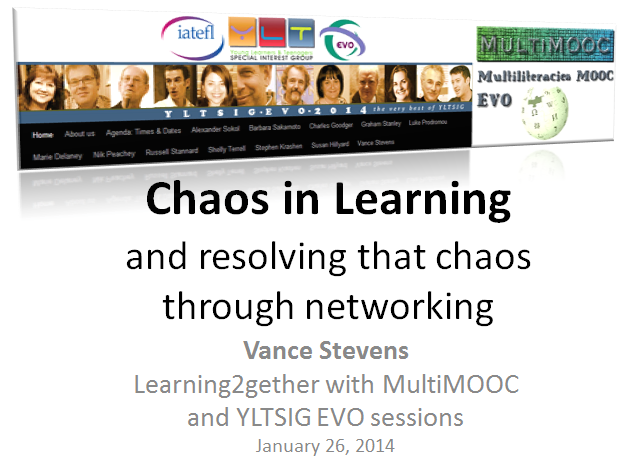 Thus #ccourse14 addresses that critical element in learning as opposed to training, the chaos factor. It presents a world as it is and a way to find a path through that world. This path draws on strategies such as connecting with others and sharing stories. 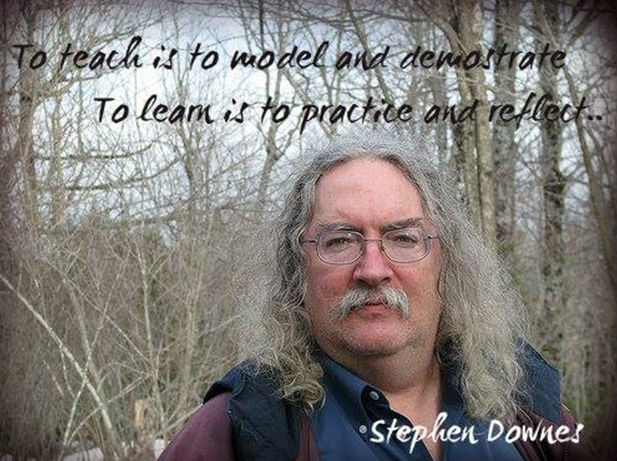 Stephen Downes famously said (first time perhaps at a WiAOC conference in 2007) that students practice and reflect, while teachers model and demonstrate. So I would like to wind up this plenary in sharing stories with you, and model how this helps us make some sense of chaotic issues, and also to model, in part by sharing this plenary online via WizIQ, how connecting with other educators as a habit in our daily lives, can help make us better teachers to students where we work. We are running out of time for a 50 min plenary address. However we can draw meaningful conclusions from our examination of MOOCs and how they impact the efforts of practitioners in their quest for effective professional development. Teachers who change their notions of how best to conduct their PD efforts through interaction with other teachers online will think of ways to effect similar changes in the way they approach their students. Regarding my personal stories, a convenient starting focus is something that happened online on Tue Sep 30. 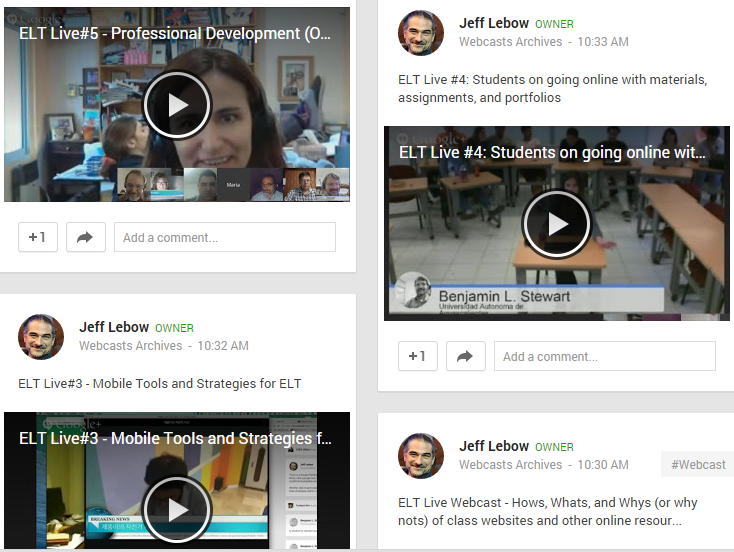 Learning2gether was in a Hangout on Air that day courtesy of Jeff Lebow and ELT Live#5. The topic was close to the heart of anyone who would take the time to participate in such an event, how doing what we were doing together online, and carrying over into face-to-face encounters with other educators in online venues, excites and inspires us to become even better educators. The hard part is how to characterize those beams of energy that are drawn from disparate corners of the edusphere, ranging the breadth of my PLN and that of countless others. These worlds converge in the online and f2f spaces we co-inhabit and collide in a burst of energy once critical mass is reached. This is happening all the time in my world, and it is this energy that re-charges my batteries and those of colleagues I work with in these mutual spaces. I'll write it up properly here before my talk tomorrow and post a link to the slideshare. Perhaps we can begin by telling the story of the five people at the online event, one of many I have engaged in weekly for the past 15 years, whom I have known the longest. I met them all online years ago, and I have met two of them personally at conferences in the USA. Let's start with them, as these associations will help me recount some of the stories that brought me here today. We'll start with Rita Zeinstejer, an English teacher and teacher-trainer in Argentina who joined Webheads in Action near to the time I started it in 2001-2002. Webheads in Action is one of my most persistent endeavors, a significant turning point in my career and in the lives of many others. 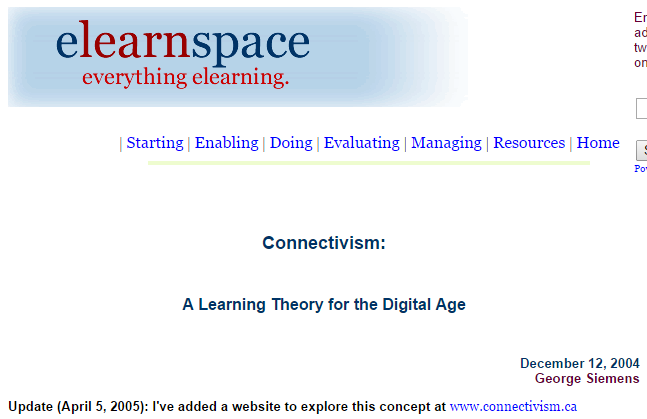 It actually started in 1998 as a community of language learners and teachers interested in understanding the emerging online / blended learning environment, but 2002 was the year that I moderated an EVO session (Electronic Village Online, http://evosessions.pbworks.com) to model what I had been doing with students for a group of teachers who to this day still call themselves Webheads. One of these Webheads, Buth from Kuwait, turned up in Cairo at a conference where I was giving another plenary talk, and because of this connection we hung out, and as she was often with me, she was invited to social events arranged for invited speakers. When introductions were made at these formal events, esteemed professors were introduced by their name and affiliation. I was introduced as one of the speakers at the conference, and Buth was introduced as "a Webhead." After that had happened a couple of times she remarked that "Webhead" was apparently perceived as carrying a status on par with other professional titles. It is a title with some substance. In 2003 Webheads participated in one of John Hibbs's Global Learn Day events. GLD was a 24-hour webinar that circled the globe region by region. I had a arranged to hold our part of the event in an auditorium at the Petroleum Institute where I worked at the time and I invited my colleagues there to attend. Webheads co-founder Michael Coghlan flew from Australia to Abu Dhabi for the occasion, and Buth flew down from Kuwait. So when our time came to engage the global audience, we had three of us physically present on stage and 62 people in the online virtual audience. In the spacious auditorium at PI we had a handful of people, 5 at the most, who stopped in for some part of the proceedings. So Webheads had the gravitas to pull in colleagues from around the world for this event, but had little appeal locally, which is in a nutshell the story of my professional life, but also the reason I am in Ahmedabad Oct 11, 2014. So getting back to Rita, she was one of the first people to join Webheads in 2002, and one of many who have worked closely together ever since. I met her in person at two TESOL conferences in the USA, but our most significant work has been online. Our most successful project was Writingmatrix, a term coined by Nelba Quintana, another Webhead from Argentina, when we decided to test an idea I thought might work http://writingmatrix.wikispaces.com/. Will Richardson had explained quite clearly how tags in blog posts could be aggregated through RSS feed readers in such a way that a teacher could follow blogs maintained by students in a class, and tease from those blogs posts meant for the class. He called RSS the 'next killer-app for education' http://weblogg-ed.com/wp-content/uploads/2006/05/RSSFAQ4.pdf. My idea was to see if we could expand the classroom to include classes from around the world. Apart from Rita and Nelba in Rosario and La Plata in Argentina, we also enlisted Doris in Venezuela and Sasha in Slovenia to get their students keep blogs for the course and tag their posts 'writingmatrix'. At the time there was a tool, Technorati, that would troll the blogosphere and return to us hits on any blog containing that tag. We had researched our tag beforehand to find that before we started the project we had zero hits, and once the project got under way we found that no matter where we were in the world, we could find blog posts from Argentina, Venezuela, and Slovenia written by students in participating classrooms, and from that these students were encouraged to read each other's posts and comment to one another in English in a cultural exchange. All teachers involved reported positive attitude shifts toward language learning in their students. Rita said her students were not at all interested at first, but they soon got into it, and produced some charming videos, where one decidedly cool students says, for example, "Wanna know where it's at? (pause) ... Tagging, man!" In this respect we had presaged one cornerstone of MOOCs -- we had come on a means of a theoretically massive, scalable at any rate, number of people joining a project to interact with other student writers, and cluster in such a way that they would pick and chose what they wanted to learn and from whom, and how much time they wanted to devote to the effort. Besides being scalably Massive, it was Open and Online, and for the teachers mentioned and their students, a part of their Course. Technorati no longer works the way it once did. It has become more a tool for the establishment blogosphere and no longer returns results on blogs with no credibility (i.e. typical student blogs). However, as I am making these remarks in India, a land with a recognized wealth of clever minds working on developing technology, I suggest that the next killer-app for education will be something that does what Technorati once did in the way I describe it here. This has never since been replicated. It has been approached, as with Stephen Downes's gRSShopper, but his script requires that bloggers register their blog with the script. 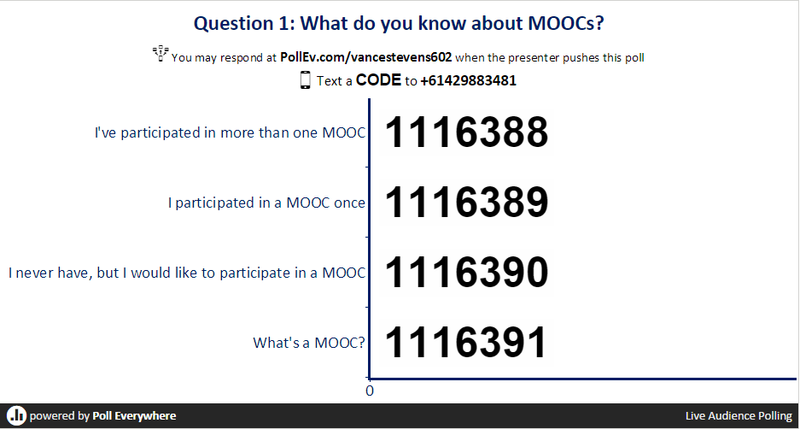 This works in MOOCs where participants register their blogs and tag some of their posts with the MOOC tag, and the script searches in registered blogs for posts with that tag and aggregates its output in a way that others in the MOOC can track what one another are doing. I have spoken with Stephen about a script that would simply find the tag wherever it happened to be in taggable posts (besides blogs:Twitter, Flickr, Instagram, Pinterest, etc.) but he said that such a tag would quickly be picked up by spammers; hence, the need for registration to filter out unwanted posts. However, writingmatrix was never spammed, and an app that would recover that simple functionality would be a real Killer App for Education. designed to teach educators how to simulcast events and then have them pay forward by training others in a phenomenal example of crowd-sourcing learning. Jeff's more recent efforts include a series of ELT live webcast Hangouts, of which the story-starter on this page was number 5. I'm getting off topic and running out of time. I am pursuing the storytelling route because stories are a way to make learning occur from chaos. We should pass this through Connected Courses MOOC. As Jim Groom says, a digital story is a narrative of thinking; so my plenary grapples with chaotic ideas by constructing a narrative of thinking about them.